The development of the sports shoe during the second half of the twentieth century led to the emergence of the largest companies in the footwear sector and some of the most recognized brands internationally. Today, Nike sells an assortment of products, including shoes and apparel for sport activities but also for urban fashion clothing. Nike constantly pushes the boundaries in material and technology for performance footwear, with the aim of enhancing the wearer’s ability. The company was founded in 1964 as ‘Blue Ribbon Sports’ by a track coach and former middle-distance runner. It was renamed Nike in 1971 when it adopted the famous ‘tick’ as logo. The company takes its name from the winged Greek goddess of victory, and is today one of the world’s largest suppliers of athletic shoes and apparel. Nike launched these football boots in March 2014 on the eve of the World Cup in Brazil. 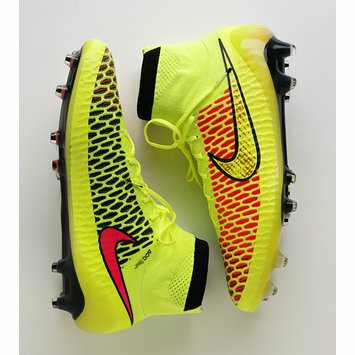 The boots feature a one-piece knitted upper, created using the company’s Flyknit technology, which aimed to provide a lighter boot and to bring the player’s foot closer to the ball with a barefoot-like touch. No separate sock is required as shoe and sock are one in this innovative design. 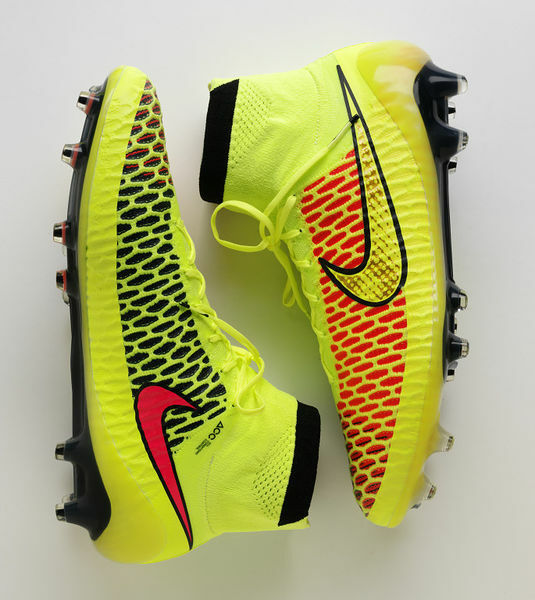 Nike launched these football boots in 2014, on the eve of the World Cup in Brazil. They featured a one-piece knitted upper, created using the company’s Flyknit technology. This aimed to provide a lighter boot and to bring the player’s foot closer to the ball with a barefoot-like touch. The innovative design also brings together the shoe and the sock.